"How to get rid of ants?" is a question every home owner and business owner has asked at some time. Ants can enter your home or business in a number of ways, and they're an organized force with a mission. Where do they come from? What kinds of ants are most likely to move in, and why? How can you stop an ant invasion or prevent a future attack? This site is designed to give a quick and informative summary for those experiencing a problem with ants. How To Get Rid of Ants: How do you know if you have them? If you see one ant in your home or business, you can assume that this is a scout for a nearby colony looking for food or a place to establish a satellite colony or new colony. When the ant scout finds what it's looking for, it will lay a pheromone trail which guides others in the colony into your home or business. But ants can also actually fly into your home to set up a new colony. In their reproductive phase, they grow wings and mate, then the queen flys into your home or business, drops her wings, finds a good location and then sets up house for a colony numbering in the tens of thousands! How to Get Rid of Ants: What damage could they cause? Ants, depending on the type of ant, can carry disease, contaminate and destroy food and bore into the wooden structure of your home. In some areas of the U.S. varities of ants can attack humans and pets delivering a health-threatening bite. How to Get Rid of Ants: What kinds of ants enter NE U.S. homes and businesses? 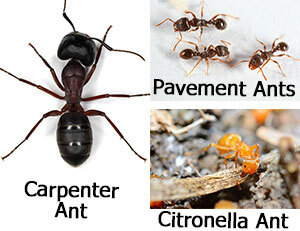 The most common ants threatening homes and businesses in the Northeastern U.S. are pavements ants, carpenter ants and citronella ants. Pavement ants are small, tiny black ants that eat just about any food that humans eat. Learn more. 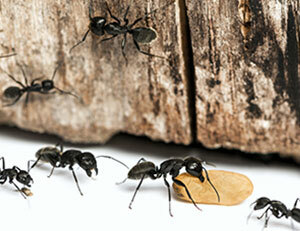 Carpenter ants, often confused with termites are most often black, and up to 1/2 inch long. They bore into the wooden structure of homes. They eat sweets such as sugar, honey and syrup. They also eat meats and pet food. Learn more. Citronella ants, also confused with termites, are right yellow. They tend aphids and collect the honeydew they excrete. Fix all gutter, roof and plumbing leaks. Carpenter ants especially love moist wood to create a home. Keep all landscaping pruned back from your house or business. Ants frequently gain access through an adjoining tree or shurb that is up against the side of a building. Calk and weatherstrip all openings: Windows, doors, cracks. Keep firewood and other wood piles well away from your home. Many ant species build nests in wood. Eliminate any access to a food source by tightly containing all food. Consider food sources such as garbage containers, pet food containers, pet dishes, even hummingbird feeders. If you have an ant infestation, immediately perform the 5 actions above. This may alone solve the problem. No food source, no wet soaking wood, no shrubbery rubbing against your home = no ants. Additional Special Measures: Basically, locate and eliminate the colony. For pavement ants, setting a few drops of a mixture of boric acid (borax) and syrup on a small piece of cardboard attracts the ants. They take the mixture back to their colony and can wipe out an entire colony. Carpenter ants are a bit trickier to exterminate. There are over the counter baits and gels. These can be effective, but ultimately you need to locate the main colony and satellite colonies in or near your home and exterminate them. It's suggested that you contact a professional carpenter ant exterminator like ApolloX Pest Control. 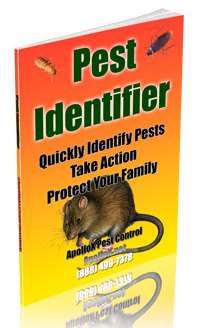 ApolloX Pest Control Has The Skill, Experience and Equipment to Get Rid of Ants! Do you think you have an ant problem? Don't wait until they further multiply.